Providing you the best range of circular daf system for wastewater treatment in food industry and daf clarifier for effluent treatment with effective & timely delivery. Tank diameter ranges 1.2 m to 16.8 m.
Dissolved Air Flotation is one of the most effective systems for the primary treatment of wastewater from food processing. We have references in Fish Processing, Snack Food Production, Milk Processing, Rendering Plants, Breweries, Canning, Bakeries, Poultry Processing, Confectionery, Potato Processing, Starch, Cheese Production, Slaughterhouses, Palm Oil Refining, Ice Cream Production, Fruit Processing, Rice Mills and Gelatin production in Mexico, Peru, Saudi Arabia, UAE, Sri Lanka and Pakistan besides India. 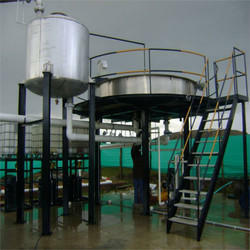 We are offering daf clarifier for effluent treatment to our clients. 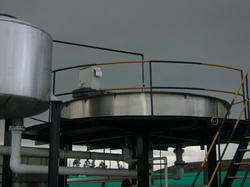 the standard float cell features a polyurethene-coated carbon steel circular tank, heavy duty tank rim, top bridge and catwalks. units can be fabricated entirely of stainless steel on request. all clarifier feature a standard sludge cone, clear water separation wall, air mixing tube (amt), central rotary joint, sludge scoop and top bridge with attached assembly.